Remember going to carnivals as a kid and just dying to win a goldfish in a bag? Trying to win it any which way, whether it was through a (probably rigged) coin toss or by shooting baskets into a hoop that was way too high for even the tallest of basketball players? Well, grownups sometimes want to win those goldfish, too. And now we can have them without any of the responsibility of feeding, cleaning or keeping them alive! 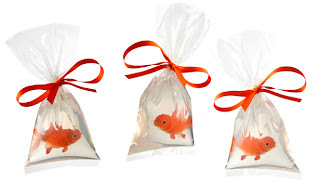 The Pet Fish Soap in a Bag, available on The Spoon Sisters website, might just be one of the cutest beauty products I've seen in quite awhile. An oversized goldfish -- don't worry, it's fake! -- is embedded within clear glycerin soap that's actually shaped like water in a bag! And at only $6.50 a pop, you can literally have a whole school of fish in your house for less than it would cost to try and win one during a carnival game! Oh my god, these are SOOO cute!